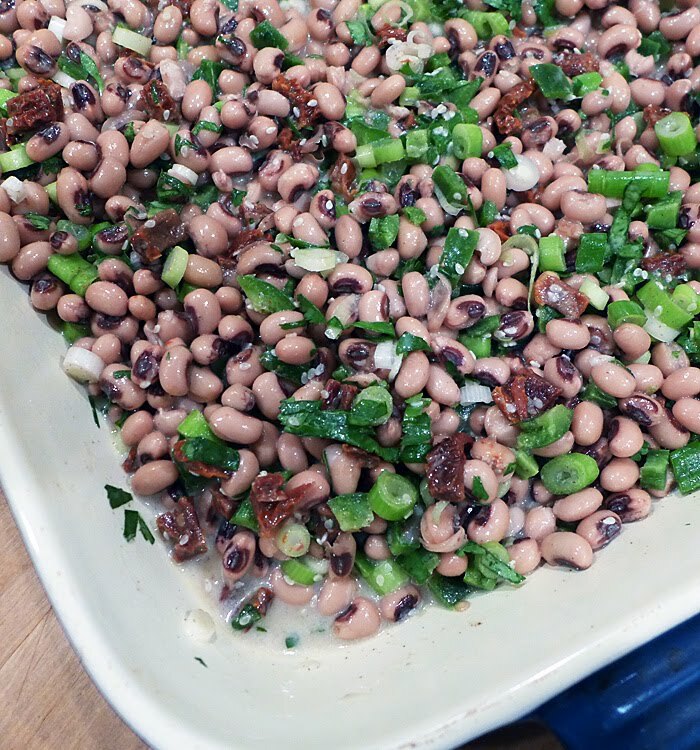 Just popping in for a few minutes to wish you a Happy New Year and share a recipe I've been making for New Year's Day for longer than I can remember. Eating black-eyed peas is supposed to bring luck in the new year. I first posted the recipe here in 2007, and periodically, when I can remember, ever since. We love it, and I'll be making it again this year, because, who can turn down the possibility of a little extra good luck. Especially now. And because it tastes great! You can find the original post, here. In other news, if you have some free time over the next few days, I can recommend a few good movies we just saw. Both Fences and Jackie were terrific films, as was Lion, Fences being particularly profound. If staying home and binge-watching TV (while scooping up Texas caviar) is more your style, I highly recommend The Crown and Rectify. Rectify, just so you know, is incredibly intense viewing with extraordinary acting. We're currently binge-watching Last Tango in Halifax, and while it started out wonderfully pleasant, it's gotten a bit heavy-duty, though we still like it a lot. 3 jalapenos, minced. Use fewer if you don't enjoy spicy food. If you hate heat, use a mild pepper instead of jalapeño. I use 3 and the spice is mild, in my opinion. 1/4 cup dried (or fresh) tomato, chopped, or 1/4 cup sweet red pepper, chopped. 1/4 cup cilantro, minced. If you dislike cilantro, use parsley. Tastes great with parsley! 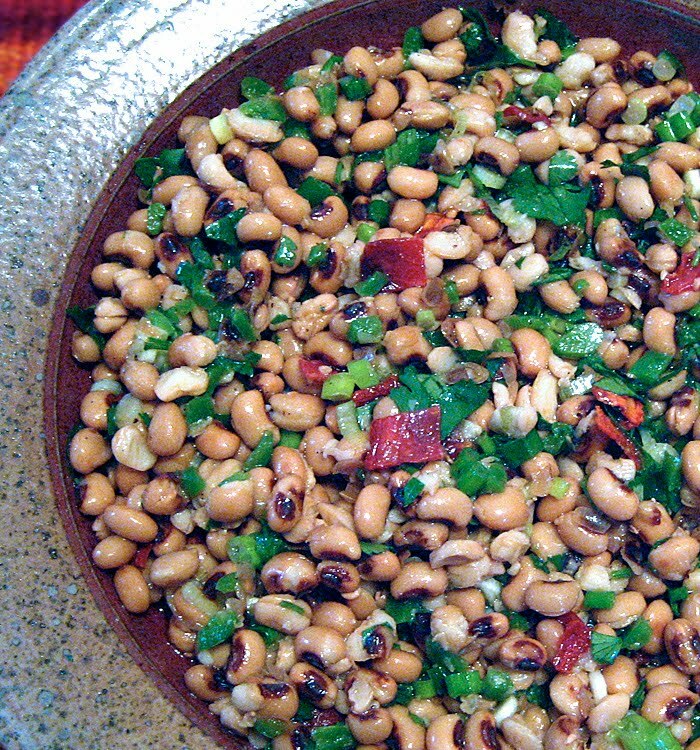 Place the beans in a shallow glass (or other non-reactive) dish with the scallions, cilantro, dried tomatoes and peppers. Put the oil, vinegar, lime juice and salt in a one cup glass measuring cup, and mix together. Add the liquid to the bean mixture and combine. Cover and place in the refrigerator for a few hours or a few days. Stir occasionally to distribute the marinade evenly. Serve with substantial chips for scooping. I used jalapenos from last summer's garden. I always freeze bags of whole, hot peppers from the garden or farmers market to use in cooking during the rest of the year. This was the first time I tried to use them uncooked. Couldn't tell they weren't fresh. Fresh squeezed lime juice makes a superior salad but I would understand if you kept a bottle of lime juice (like Santa Cruz organic) in your refrigerator for "emergencies." The beans will still taste great. This is an old recipe and I'll probably revise it to use less, or no oil. I'll update if and when I do. Also, since I now have an Instant Pot, and cooking beans from scratch has become more fun, I'll probably use dried beans. Printed by permission of the publisher, The Experiment. So, vegans, have you ever had a friend tell you they would love to invite you for dinner but they have no idea what they could make? What they don't realize, is a lot of us feel the same way about them. 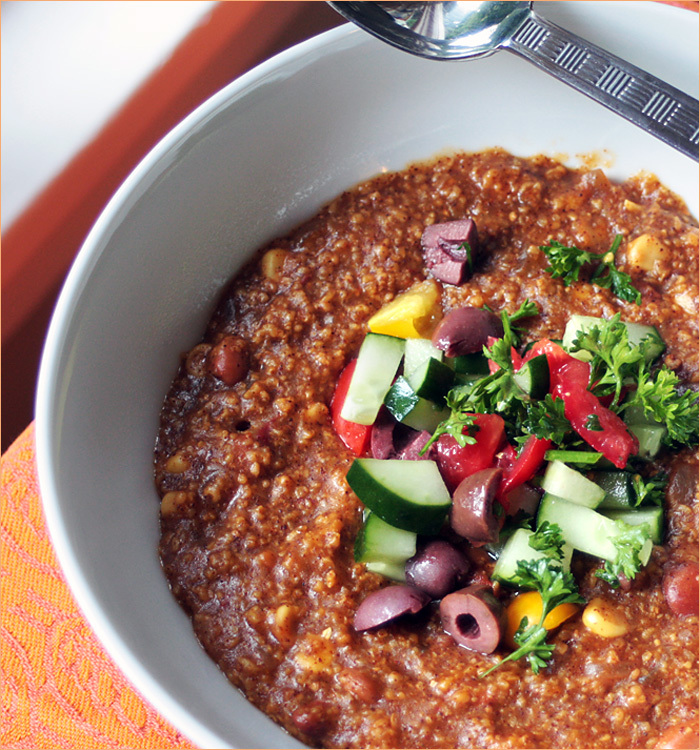 We agonize over what vegan dishes we can make to appeal to our non-vegan family and friends. I feel pretty lucky that my non-vegan dinner guests have been extremely accepting (or at least they are good liars!) of my vegan cooking, but I still spend a lot of time thinking about what foods would be most appealing. If you're always trying to come up with tasty vegan foods for omnivorous guests, Kristy Turner has a solution for you. Her new cookbook, But My Family Would Never Eat Vegan, 125 Recipes to Win Everyone Over is filled with recipes meant to delight the non-vegan eater. Of course, we vegans benefit from her creativity, too! Not only are the recipes satisfying, the book itself is a beauty. It's easy to read, and filled with gorgeous photos by Kristy's husband, Chris. Follow my link to amazon.com and 'look inside the book' for a generous preview of Kristy's compendium of general cooking-related information, as well as many of her recipes. Then order a copy for your bookshelf! I sampled four recipes when I received my copy. The first one I tried was Kung Pao Cauliflower. 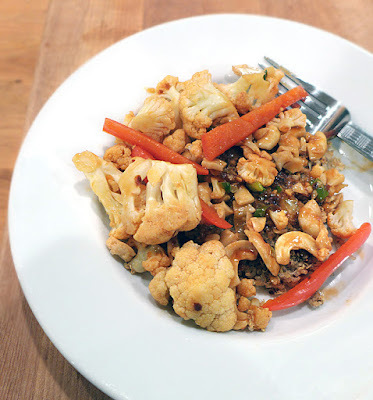 I was craving Chinese food, and Kristy's version of Kung Pao "chicken" was mighty appealing. After enjoying the dish myself, I can easily see serving it to family; I can't imagine anyone not liking it. 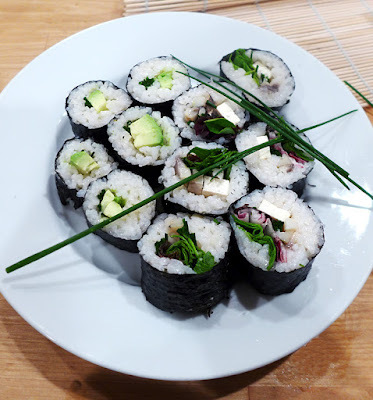 It's supposed to have green onion strands beautifying the dish as a garnish, but unfortunately, I took the photo before remembering to add the onions, so just picture it delicately graced with green onions. Delish! 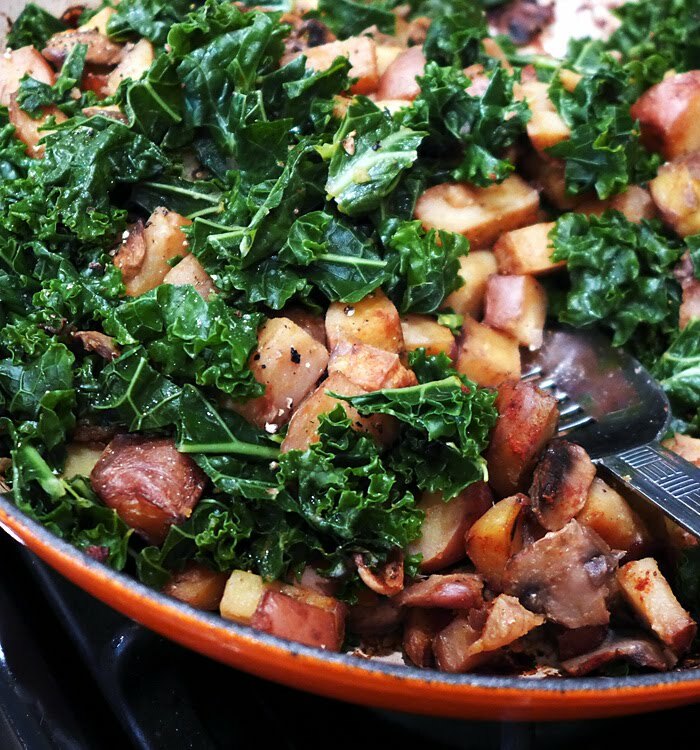 The next recipe to catch my attention was Mushroom-Kale Skillet Hash. The end result was toothsome, but I had a bit of a problem following the directions for this one. The potatoes kept sticking to the pan, and refused to crisp up, even though I turned the heat down and added a splash of broth, as directed. They also took forever to soften — maybe I had mutant potatoes. I eventually decided to cook the kale in a separate pan and add it to the potatoes after they were finally cooked, because it didn't look like there was any way the kale would soften in that potato-filled pan. It all worked out in the end, and although I ran into a bit of trouble during the preparation, we definitely loved the final result. My next delicious recipe adventure was Chinese Chickpea Salad. I may have taken a few liberties with some of the salad ingredients, but nothing major. It looks like I added some arugula, and used peanuts instead of almonds — and the original recipe was topped with crumbled rice crackers, which I didn't have. 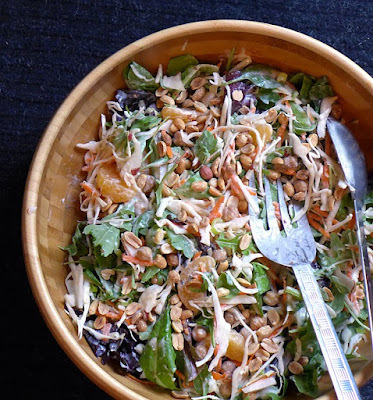 However, the basic idea of crunchy salad with cabbage, toasted chickpeas and miso-ginger dressing is what matters, and it was perfect. 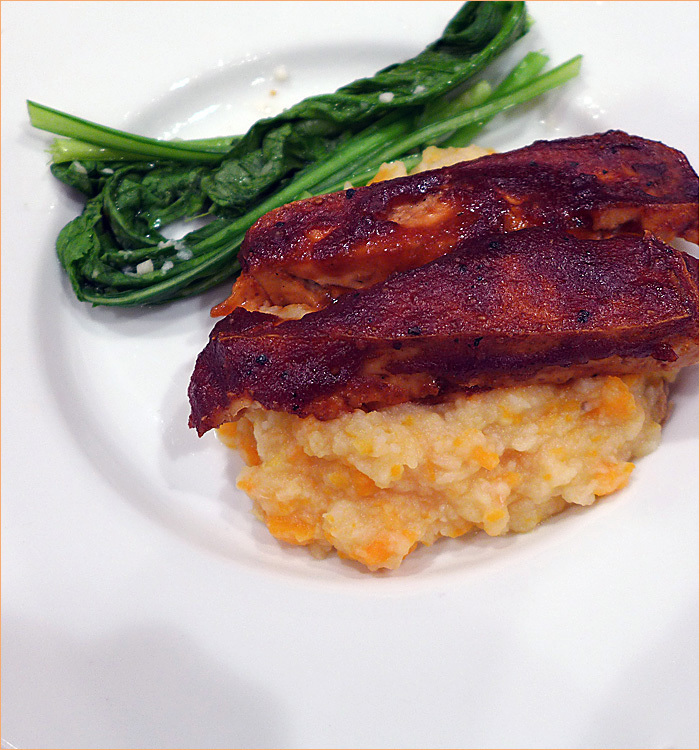 The last dish I'll show you is Maple-Miso Tempeh Cutlets — I've even got the recipe to share. 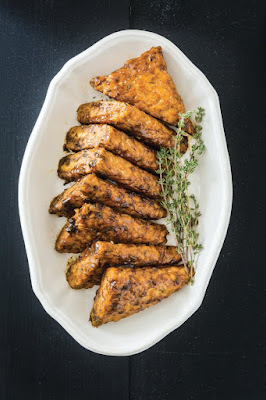 Tempeh is one of those foods that some people, even vegans, don't like, but, if there's one tempeh recipe that might tempt the recalcitrant, this may be it. It was wonderful the day I made it, and great the next day as cold leftovers. I'm thinking of bringing it to a family dinner this weekend. 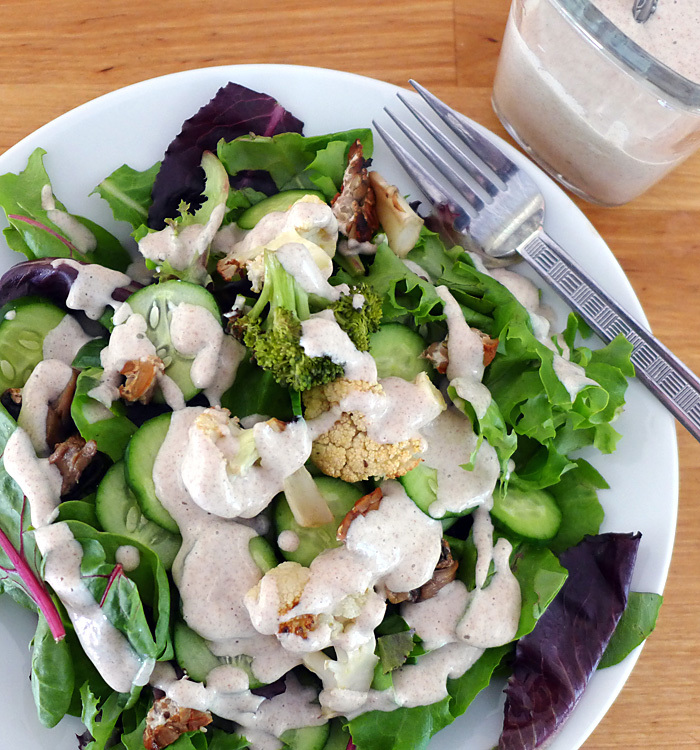 Either this or the Chinese Chickpea Salad — or both! 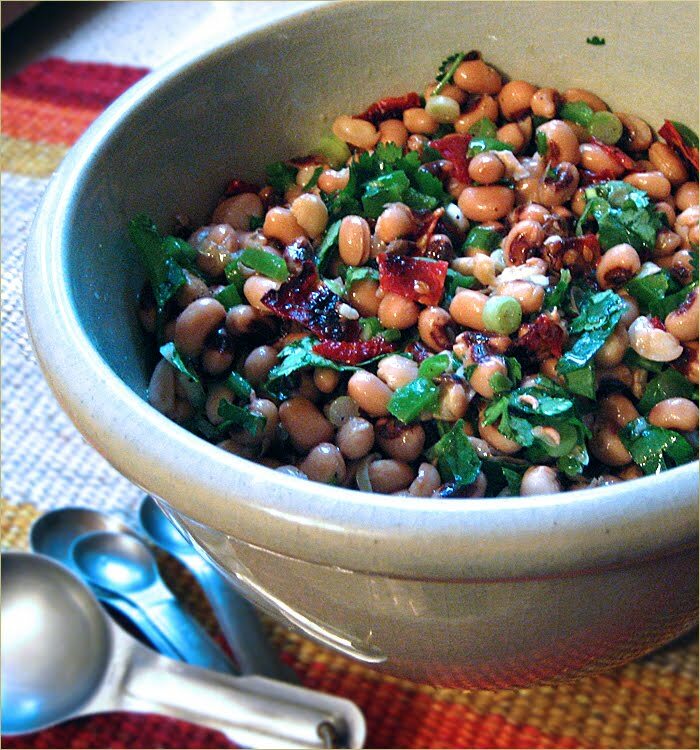 Do you have a favorite dish to make when cooking for non-vegan family and friends? Kristy and her publisher have allowed me to share a recipe with you, and I've chosen the fabulous Miso-Maple Tempeh Cutlets. I hope you'll try it. 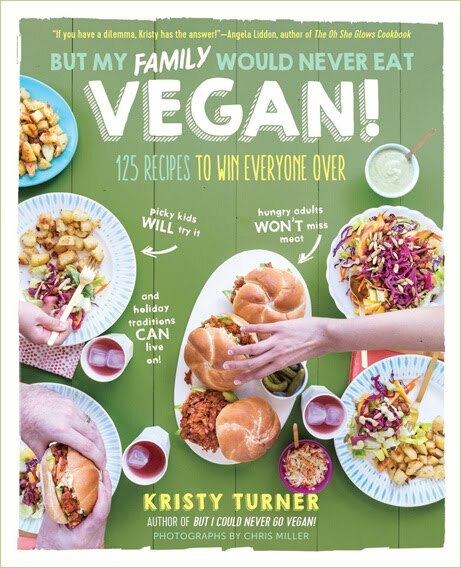 As I mentioned earlier in the post, you can see more of Kristy's recipes by looking at her book on Amazon. Photo credit: Chris Miller. Printed by permission of the publisher, The Experiment. boil, then reduce to a simmer. Steam the tempeh for 15 to 20 minutes, flipping the triangles once halfway through. Remove the steamer basket from the pan (keep the tempeh in the basket) and set aside. and bring to a boil. Once boiling, reduce the heat to a low simmer. 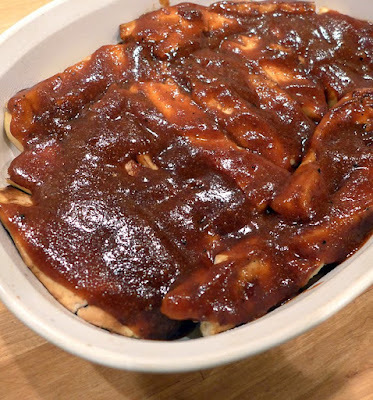 Let the tempeh simmer in the sauce for 10 to 12 minutes, flipping them once halfway through, until the sauce is absorbed and starts to caramelize. Remove from the heat and add salt and pepper. Serve immediately. Leftovers will keep in an airtight container in the fridge for 4 to 5 days. that you have two thinner triangles. Use those in the sandwich. Disclosure: I received a free copy of the book for review. All opinions are my own. The blog post contains Amazon links. Back (way back) in the old days — probably before you were born — before I was a vegan or even a vegetarian, back when I lived in upstate New York, I had a good friend who introduced me to barbecued short ribs. I'm not going to lie about eating and enjoying the ribs, though the thought grosses me out now, but we shared many a barbecued dinner in those short-lived, short-ribbed days. When I became a vegetarian, the short ribs did cross my mind, as I traded them in for a kinder lifestyle. Just recently, the very same friend made a comment about the ribs from our barbecue days, on facebook, in regard to my current dietary preferences. I'll never go back to my pre-vegan diet, but you know, when I saw a recipe for tofu short ribs on Isa Chandra Moskowitz's new blog, well, I had to make them. They are preferably made from super firm tofu, but regular tofu can be pressed, and used instead. I had so much regular tofu in the fridge I couldn't justify buying more, so I got out my press and went to work. I don't have a tofu press, but I have a Japanese salad press. It works great but it's so old I worry about what might be in the plastic. I use it so infrequently these days though, that I hope whatever toxic chemicals are in there won't have too much of an impact. The ribs turned out great but I think the extra chewiness that comes with extra firm tofu would be even better. I didn't follow the sauce recipe exactly, but it was extremely delicious anyway. I made half the sauce recipe but, as you can see, there was still plenty of sauce. I also left out the hoisin sauce because I didn't have any. What I did instead was look up recipes for hoisin sauce, and incorporate the main flavors into the recipe. The sauce was fabulous, in spite of all my changes, though I'm sure the original was even better. The other great part of the recipe was the gingery mashed root veggies. I used parsnips, turnips, carrots, yukon gold potatoes, and a chunk of leftover butternut squash, which is not a root, I know, but I hate to waste food, and it was in the fridge. I left out the coconut oil but it was still fantastic. I didn't realize how delicious root vegetables could be, and they were easy to cook in my Instant Pot. As a bonus, I steamed the turnip greens and served them on the side for a little touch of green. I highly recommend you try Isa's recipe! Now. Another recipe I was inspired to try was one for baked, oil-free-gluten-free hushpuppies. Coincidentally, the same friend who had introduced me to short ribs, also introduced me to old-fashioned, deep-fried hushpuppies. I never deep fry anything, so was delighted to find a recipe for baked hushpuppies. I followed the recipe pretty exactly but my hushpuppies didn't turn out quite as beautifully as the ones on the vegan 8 blog. Nor did my photo come anywhere close to Brandi's wonderful images. My husband and I really enjoyed eating the hushpuppies, even if they weren't as pretty as the originals, but next time I may not roll them in quite as much coating, since the extra coating was a little gritty. I do want to make them again, though. 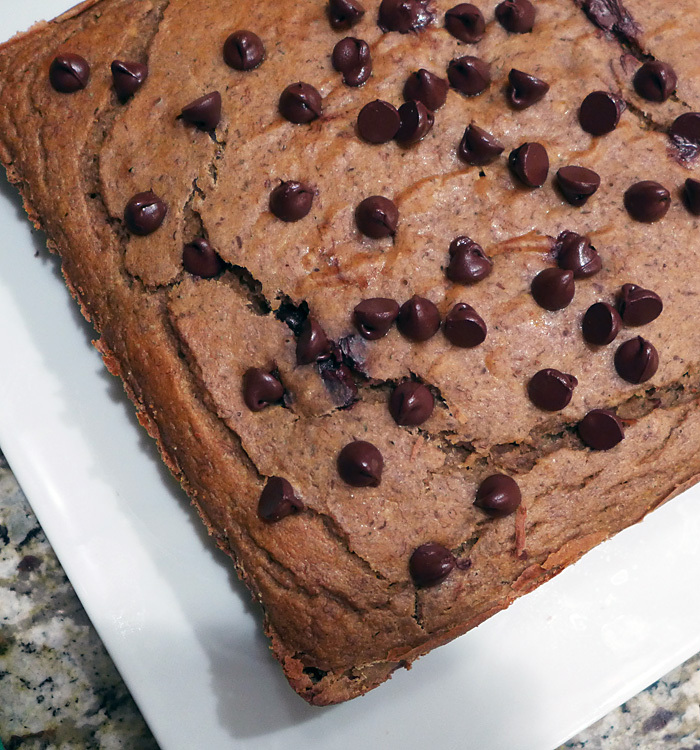 I needed a quick, easy dessert recently, and my inspiration came from right here on this blog. My granddaughter, who is very picky, has always been a fan of the walnut date confections I posted about back in 2010. The original recipe came from Chow Vegan. When I made them this time, I didn't look back at the recipe so I didn't remember it was supposed to have coconut, and be made with almonds. 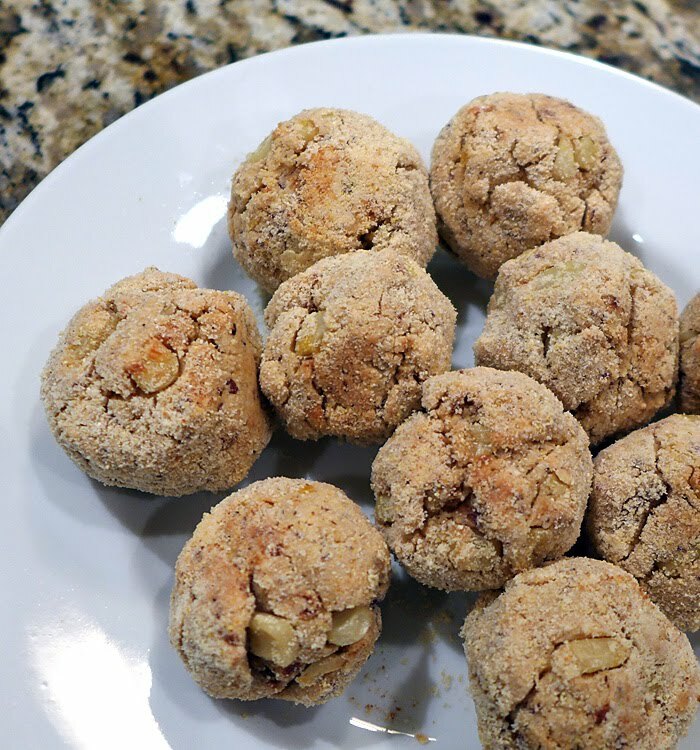 Ironically, I didn't have walnuts OR almonds, so I used 1/2 cup almond flour to 1/2 cup packed medjool dates, and one teaspoon vanilla. I also added a teaspoon of water to give the food processor a hand. I rolled half the balls in cocoa powder and half in coconut, then refrigerated the caramel-tasting treats for a couple of hours to firm them up. 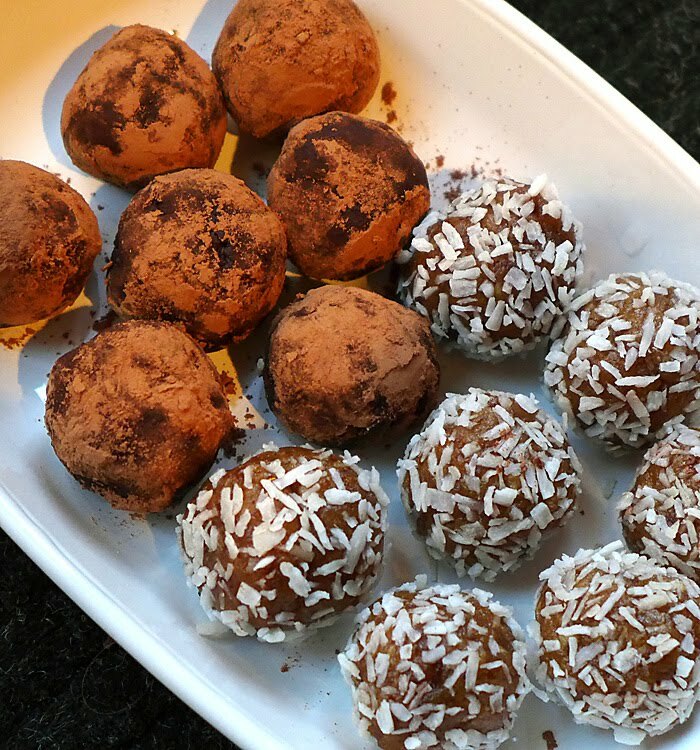 I especially liked the bitter taste of the cocoa powder next to the sweetness of the dates. For a little extra burst of flavor, mix a bit of flaked sea salt with the coconut before rolling the balls in it. I had another food item to post but I'm tired of writing so it will have to wait for another day. Enjoy your week! Our Thanksgiving dinner wasn't held at my house this year, so I could spend the whole day before Thanksgiving happily making cranberry sauce and desserts, and not worrying about the rest of the meal. In theory, anyway. In reality, the cranberry sauce making went on without a hitch, while everything else involved one mistake after another. 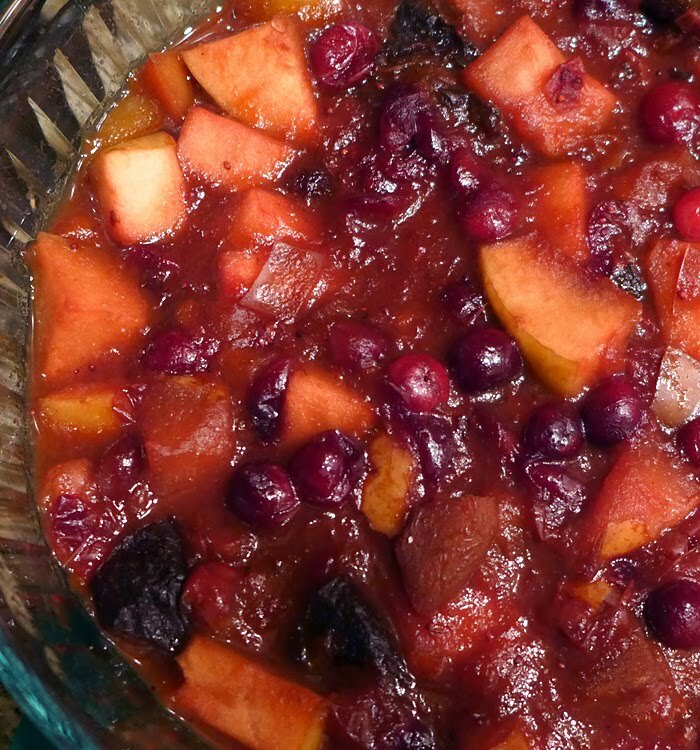 Instead of a traditional cranberry sauce, I based my cranberries on a recipe called Autumn Fruit Crock from Robin Robertson's cookbook, Fresh From the Vegan Slow Cooker. I had tested the recipe when Robin was writing her cookbook, and loved it. It reminded me exactly of the fall fruit compotes my grandmother and mother made when I was a child. Their compotes contained mainly fresh apples and pears, plus dried prunes and apricots. I think there also may have been pineapple. I used to make it, too, but had forgotten about it until I saw Robin's recipe. 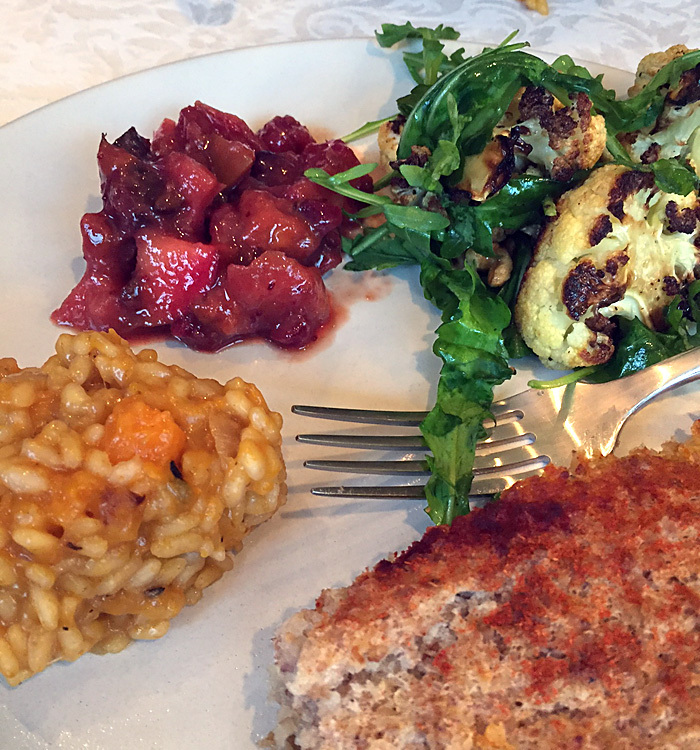 For Thanksgiving this year, I adapted the recipe to make it more cranberry-centric, and cooked it in my Instant Pot using the slow cooker setting. Right up there with the deliciousness was the fact that once I put the ingredients into the cooker and turned it on, it required no input from me until it was done. Although I used an Instant Pot, any old slow cooker would be perfect. (Recipe guideline at end of post.) I think everyone liked the cranberry compote better than the cranberries-plus-fruit I usually make for holidays. With the cranberry sauce happily cooking itself, I turned to the pumpkin pie. It seems that every year since I lost my tried-and-true, perfect, easy pumpkin pie recipe, I try a new one, and this year was no different. I chose voluptuous pumpkin pie, which I saw on Isa Chandra — Isa Chandra Moskowitz's new blog. The recipe is from the Voluptuous Vegan. I used butternut squash, and followed the recipe closely. Though I don't know why it required four teaspoons of oil, I grudgingly added three teaspoons, but I've made great pies in the past and have never added oil to the filling. I wanted to follow the recipe as written, but when I make it again, I'm going to try it without the oil. Do you add oil to pumpkin pie? I like to sprinkle a ring of chocolate chips around the edge just after the pie comes from the oven, but whipped coconut cream, as shown in Isa's photo, would be great. 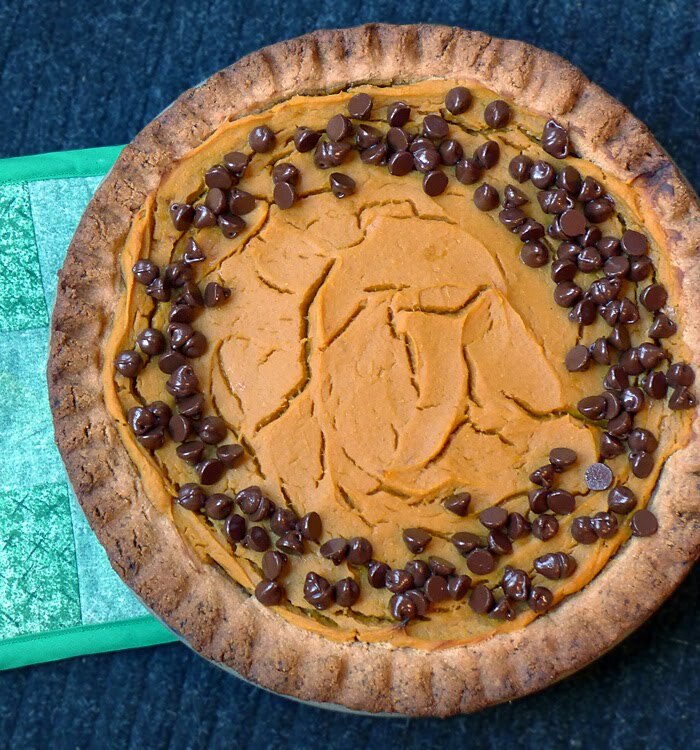 Last year I accessorized my pie with vegan marshmallows. The filling was pretty straight forward to make — it was the crust (my own recipe) that tried to trick me. I was carefully buzzing the crust ingredients in the food processor to get a workable pastry dough, and instead of adding a teaspoon a water at a time, I accidentally added about 1/3 cup! The dough immediately turned to mush, and I should have tossed it and started over, but I tried to save it by adding a lot of almond flour. I was eventually able to roll out a crust, more or less, and hoped for the best. The pie had to bake for 60 to 65 minutes and there was a warning to cover the crust if it started to brown too fast, but I managed to burn the crust in spite of the warning. It's a Thanksgiving miracle the pie was delicious! The cake was not blurry in person. One family member doesn't like pumpkin or cinnamon, so I made a banana cake, too. I used a recipe (more or less) from my blog. I say 'more or less' because I'm as likely to change my own recipes as anyone else's. The cake had been in the oven nearly 10 minutes when I glanced at the counter and saw the flax egg still in the measuring cup. 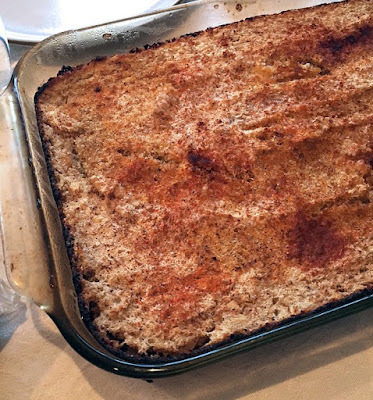 I don't usually curse on the blog, but that's not necessarily the case in real life — especially when a crucial ingredient gets left out of a recipe. I grabbed the cake from the oven, and whipped in the flax with a fork, as best I could. Fortunately, it turned out great, in spite of my absent mindedness. 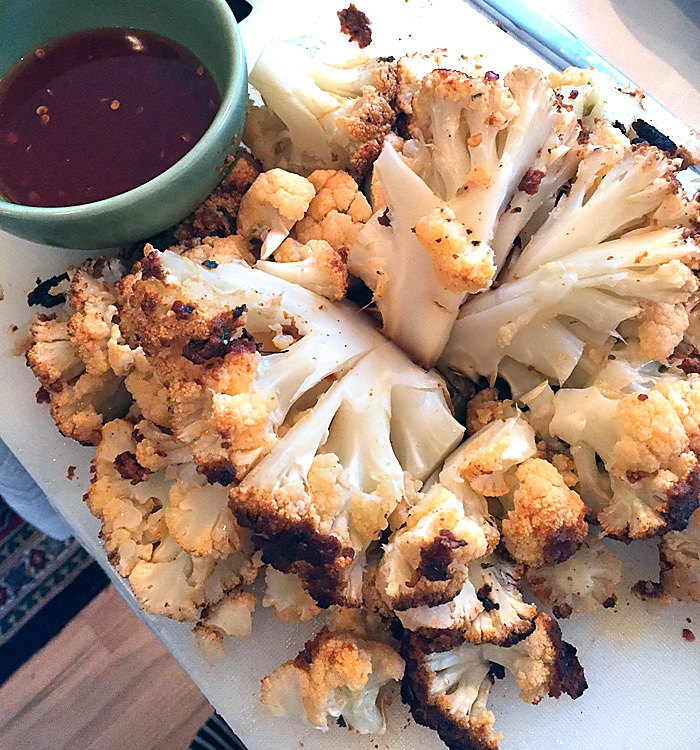 There was a whole roasted cauliflower with harissa sauce. 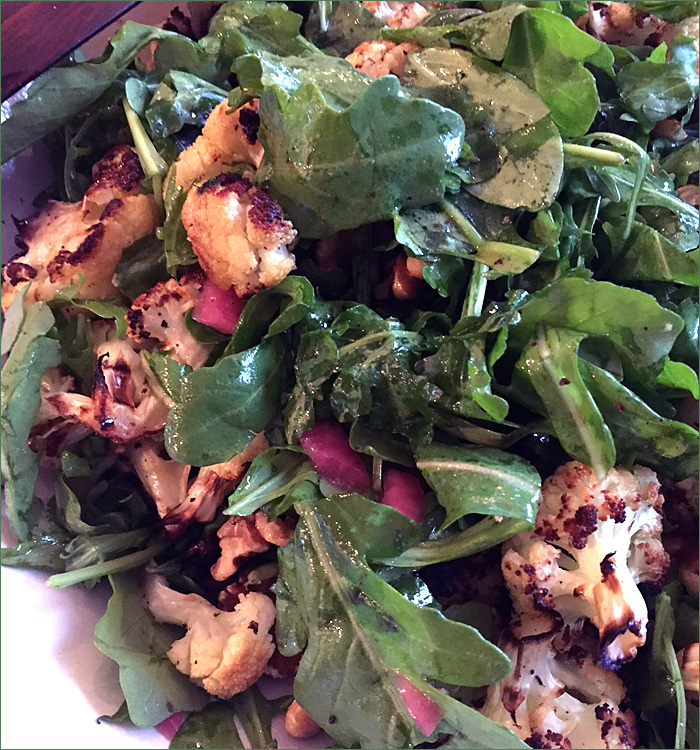 And an arugula salad with roasted cauliflower! Roasted cauliflower was on everyone's mind this year. Of course, no holiday meal would be complete without potato stuffing — or potato kugel. This year my son made the stuffing with extra buckwheat, and it tasted great! 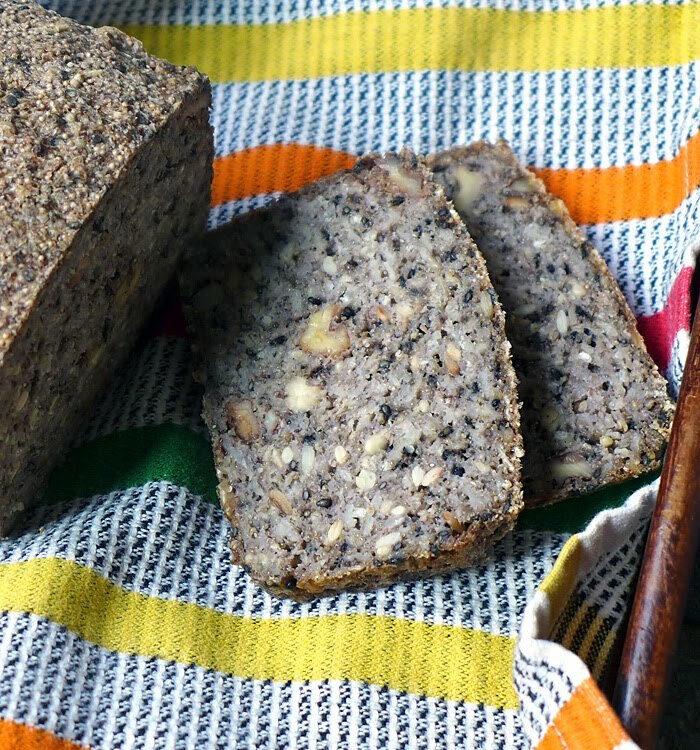 The original recipe, which came from Russia with my maternal great grandparents, was made with bread, but we now make it with buckwheat, a variation I picked up years ago when I was dabbling in a macrobiotic diet. It tastes great either way. Here's my (first) plate. I hope that all of you who celebrate Thanksgiving, had a pleasant holiday. We did. 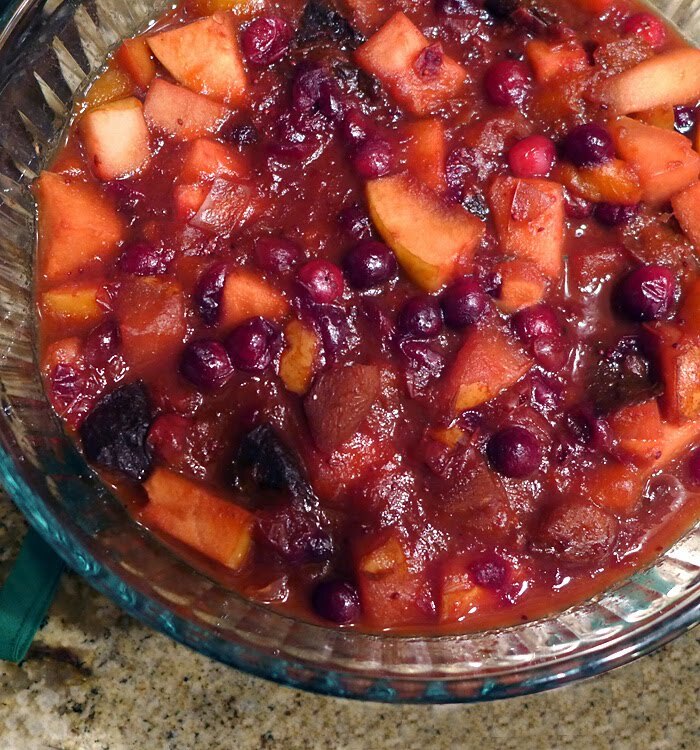 Adapted from Autumn Fruit Crock in Fresh From the Vegan Slow Cooker by Robin Robertson, and memories of my mother's and grandmother's kitchens. The reason I refer to this as 'guidelines' rather than 'recipe' is because I didn't write down exactly what I did, and am relying on memory. However, you can do pretty much what you want, and adjust to your preferences. I like my cranberries tangy, but feel free to make them as sweet as you wish, and to change up the fruit. I recommend keeping the mango as it adds a lot of natural sweetness, requiring less sugar to be added. 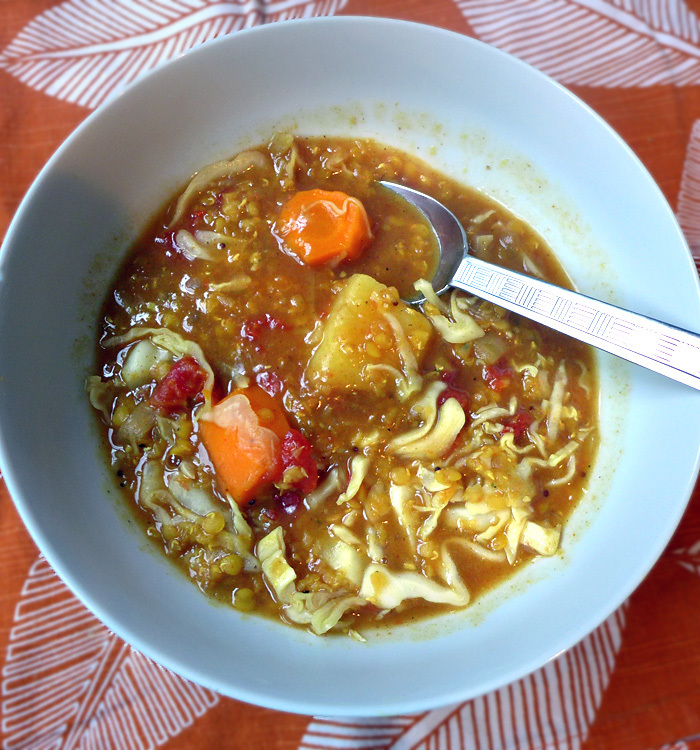 This is a great dish to serve anytime, any holiday — all fall and winter. You can change up the type and quantity of the fruit except maybe for the cranberries, though I recommend keeping the mango as it adds natural sweetness, and goes so well with the cranberries. Dice all the fruit (except cranberries and raisins, if using, or frozen mango) to approximate size of cranberries. I didn't peel my fruit. Add all ingredients, except vanilla, to a slow cooker. Add the vanilla and taste for sweetness. Chill before serving. Can be made the day before needed. Thickens more as it cools. You can add a cinnamon stick to the pot before cooking. I have a cinnamon disliker in the family so I left it out. My compote turned out nice and thick, but if yours doesn't, cook a short while longer without the lid. postscript: My thoughts and donations, especially at Thanksgiving, go out to the water protectors at the Dakota Access Pipeline. I've been sadly disturbed during the recent election process. My angst started in the weeks before the vote, and increased dramatically after the election. I'm just starting to function again, but barely. I wanted to do a post Monday, but just couldn't get myself in gear. It's probably just as well I missed the deadline to sign up for mofo. I'm still feeding and walking the dog, so I'm not completely lost, but the election has taken a toll, so I'm reaching into my 'random' folder and posting photos of things we've eaten lately — or not so lately, starting with a nice, soothing lentil soup with shredded cabbage (above). 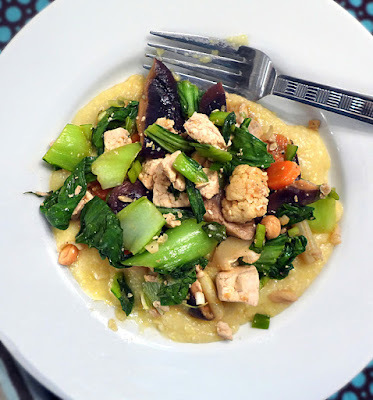 I made it in the Instant Pot, which I wrote about here. Here's another seed bread result — I think after consuming way too much of the bread, then taking a break from it, I'm about ready to make another loaf. I miss it. I started experimenting with yeasted versions but am not yet ready to share the results. I'm still enjoying making salad dressings sans oil, and one of these days I swear I'll post some of my favorite recipes. I've started writing down ingredients, but then I always add a little extra of this or that, and forget what exactly it was. I'm not meant to be a recipe developer, I'm afraid. This was a 'cheesy spaghetti squash' recipe from a cookbook, but I won't tell you which one. It was unpleasant. I blame my husband. Sometimes you just have to order pizza. 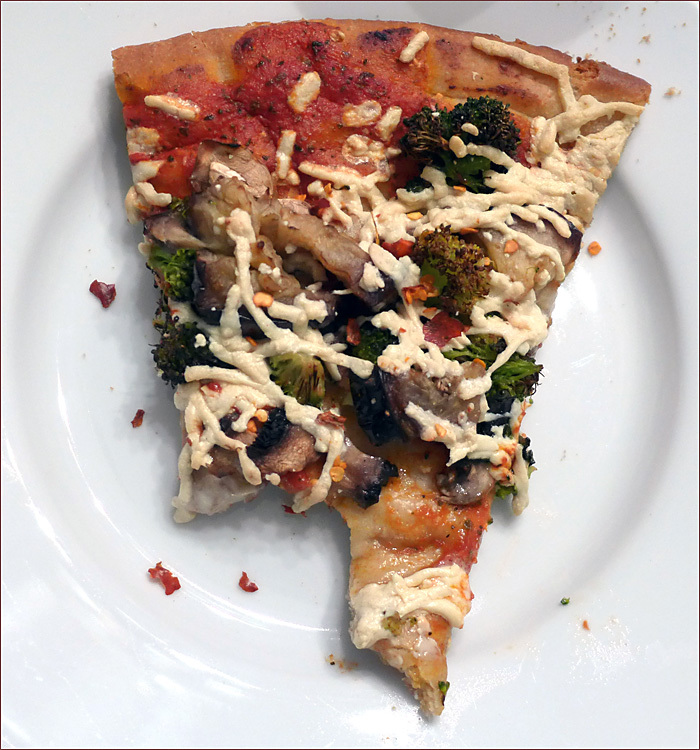 This is a slice of gluten-free vegan pizza from Razzis Pizzaria. I have to say I never get sick from Razzi's food, which is more than I can say about much of the restaurant food I try. And it tastes good! 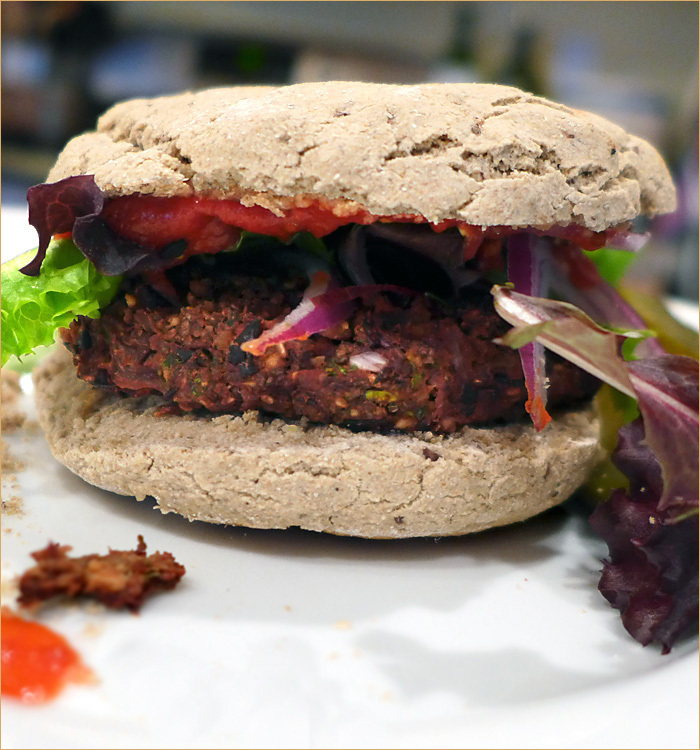 They have four separate menus for traditional, gluten-free, vegan and gluten-free vegan food. 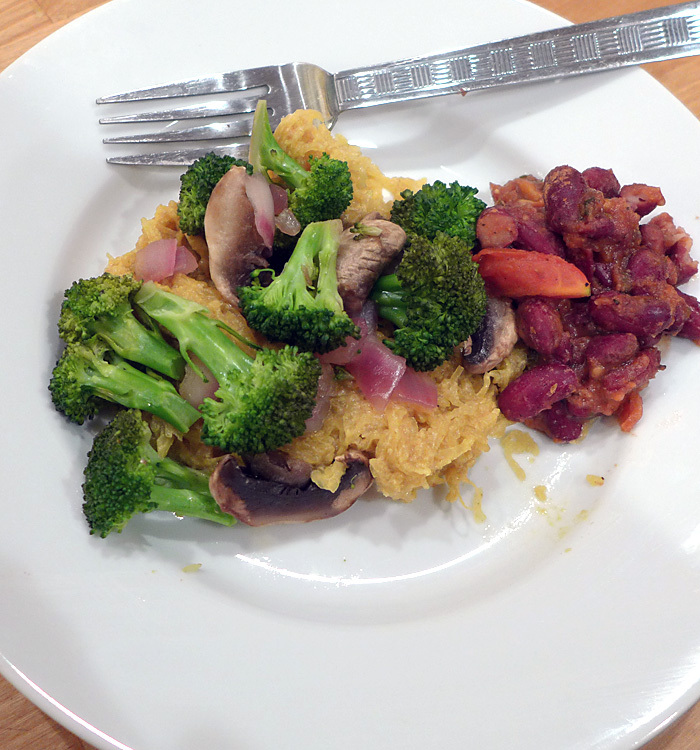 Speaking of food, I'm pretty hungry so I'm off to the kitchen to dish up some of the leftover chipotlé polenta bake. Maybe I'll make it into burgers. Well look at this — here I am taking my own advice and making the little pumpkin tarts that appeared in my last post. Only those were, in reality, little sweet potato tarts, and the ones I just made are little butternut squash tarts. I like pumpkin pie, I really do, but over the years I've come to prefer pumpkin pie when it's made with something other than pumpkin. In a pinch, if I really need a pie fast, I might use canned pumpkin, but foods like sweet potatoes and winter squash (dry winter squash like kabocha or butternut) are sweeter and more flavorful than pumpkin. 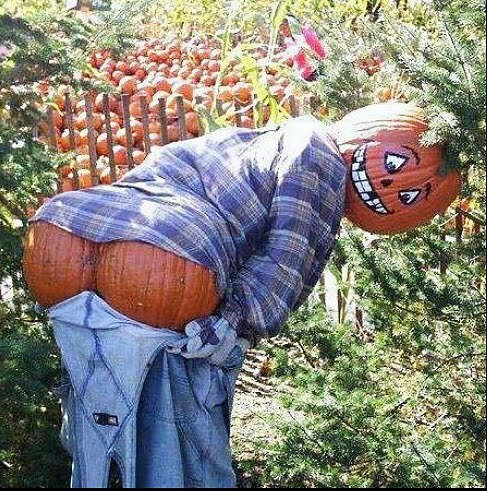 Pie pumpkins also work, but I like butternut! I have a set of eight, four-inch tart pans that I found several years ago at an estate sale, and they make the cutest little tart shells. They are non-stick, and it's thrilling to me that they actually work. Don't you just love it when the tart shells pop out of the pans like they're supposed to? I made six tarts, and although I served them whole, I think half is probably enough for a serving. The problem was the chocolate topping I made was hard, and difficult to cut through. If I were planning to cut them in half, I would probably opt for a soft chocolate topping, or perhaps a dollop of coconut whipped cream, as in the original recipe. The chocolate sure was good, though. WAIT. Did I just say half a tart is enough? Scratch that. I just ate a whole one and it was just right. 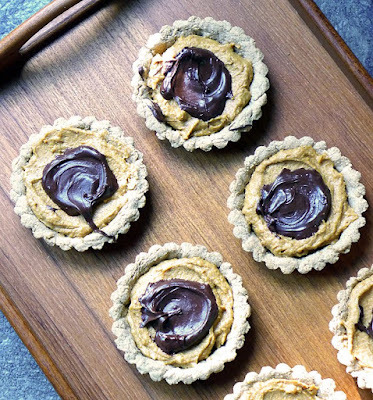 You can make the tarts the day before you need them; they taste even better the next day. Well, here it is the day before election day. (Not to mention it's been the most stressful, horrible election I can remember. I can't sleep, and I've been nursing a headache for two days.) Think about who would be the best candidates for President, Senate, and Congress, and GO VOTE! Then make yourself little tarts as a reward. Whisk together the flours, baking soda, baking powder, salt and spices. Mix in the oil and maple syrup, to form a cohesive pastry. Add water one tablespoon at a time if needed to form a press-able dough. Use your hands! Divide the dough into six equal balls and press each one into a tart pan, making sure to fill the top edges of the pans. Bake in a pre-heated 350˚F oven for 15 to 20 minutes, until golden. Cool about 15 minutes, then pop the shells out, and refrigerate until ready to fill. heaping 1/2 cup of raw, unsalted cashews soaked at least four hours, and drained. Soaking over night will make the filling easier to blend. tightly packed, rounded 1/3 cup of soft, pitted medjool dates. If your dates are dry and hard, soak them while you are soaking the cashews. Grind the cashews in a food processor until they are pulverized. Add the chia and dates and continue to process. Add the cinnamon, nutmeg, ginger and salt. Add up to 1/4 cup almond (or other plant-based) milk to make processing easier. Process until the mixture is smooth and creamy. This may take a while. Taste to see if the filling is sweet enough for you. If not, add a tablespoon of maple syrup. Divide the filling among the six tarts. There will be a small amount left over to eat the next day as pudding. Place 1/3 cup of vegan semi-sweet chocolate chips in a small glass dish, and microwave for 30 seconds. Check to see if they are melted. If not, microwave for 30 seconds more. Stir until smooth and top each tart with melted chocolate. Refrigerate several hours before serving. 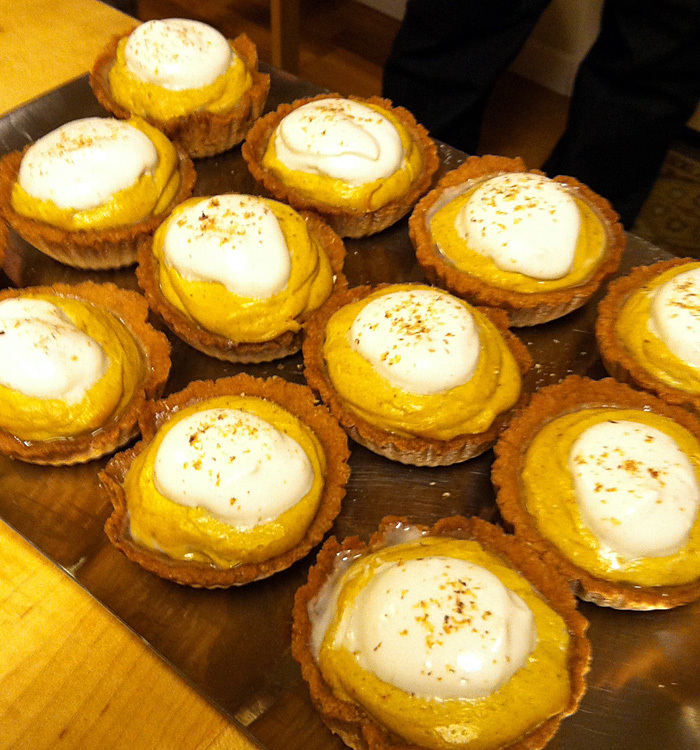 The longer the tarts are refrigerated, the firmer and more pumpkin pie-like the filling will be. 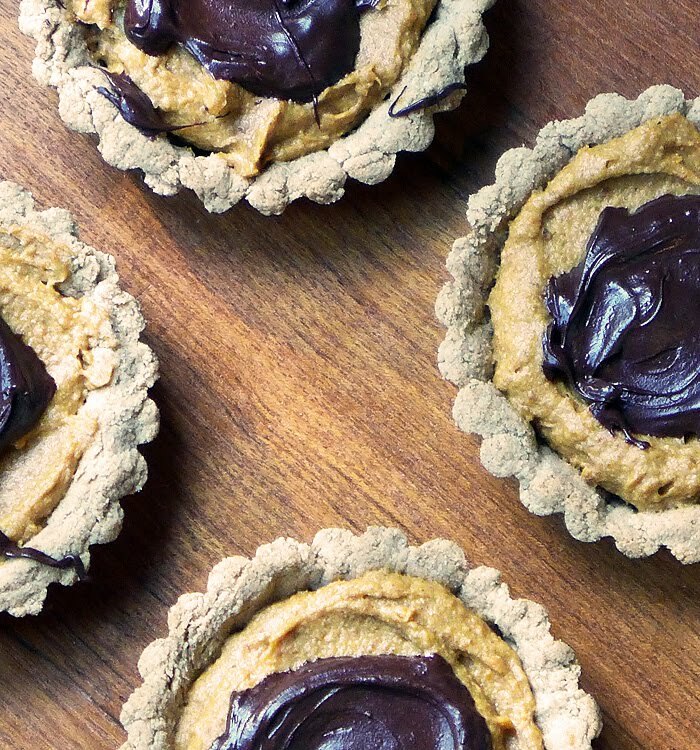 The recipe was adapted from one for mini pumpkin pie tarts from Danielle Walker's Against All Grain blog. The original recipe was a guest post by Beth from Tasty Yummies. 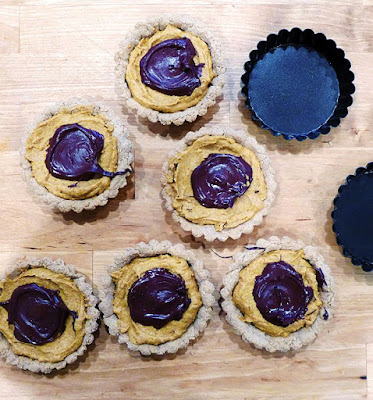 You can read about little pumpkin tarts, here, and get a link to the recipe. They are gluten-free and vegan. Typical breakfast as of late. My cooking lately has bounced between making delicious things in the Instant Pot, and baking bread, but, in reality, the bread has taken over. I keep trying to post a recipe, but I get caught up in explanations, feel overwhelmed, and go for a walk instead. It's not that the bread is hard to make — the opposite, actually — but it's hard to explain in a few words. As you can see in the photo above, eating the bread is easy, and making avocado toast has reached the top of my list of "things to have for breakfast." 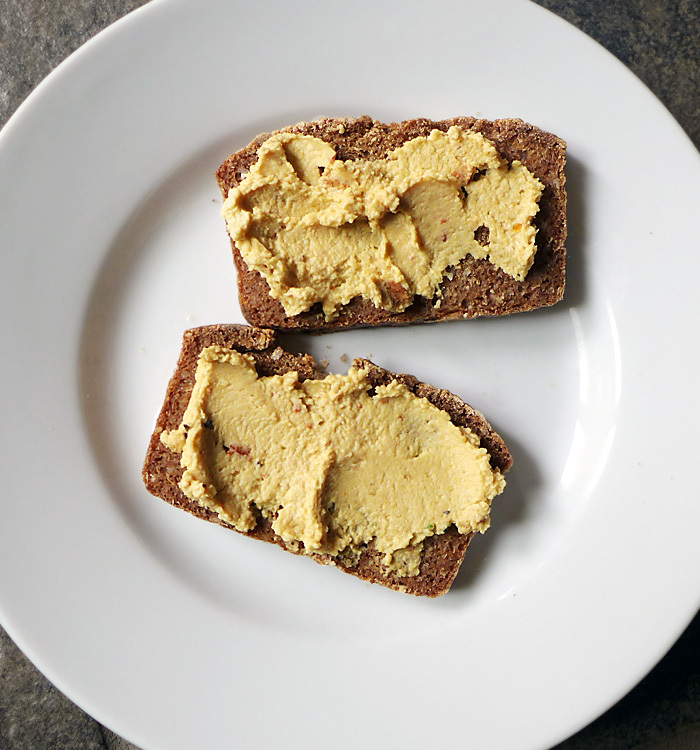 (The above toast also had a layer of hummus, which I don't particularly recommend, and a layer of tomato, which is great.) Maybe next I'll try a suggestion that appeared on the blog in 2010 for eggy tofu on toast. It had a layer of tofu sprinkled with black salt on top of a layer of avocado. I started the bread adventure by baking a sourdough buckwheat loaf. (Click here for the original recipe.) It contained only buckwheat groats, water and salt, and you can read about my experience here. The loaf was interesting and tasty, though not particularly sourdough-like, and although I liked it, I didn't love the texture. I can never leave a recipe alone, you know, so I started thinking of ways to adapt it to be more to my liking. 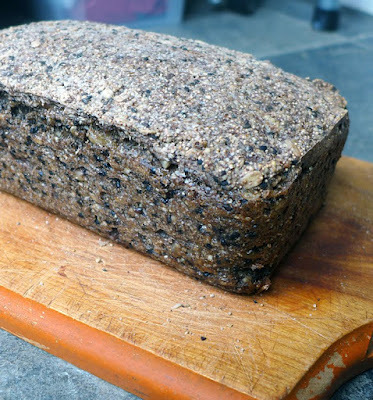 I remembered a nut and seed loaf I'd made and admired a year or two ago, and wondered if I could combine the best features of both recipes. In my blog post I wrote, "Some time ago I made a very good nut and seed bread based on Josie Baker's adventure bread, (which in turn was inspired by My New Roots Life Changing Bread). 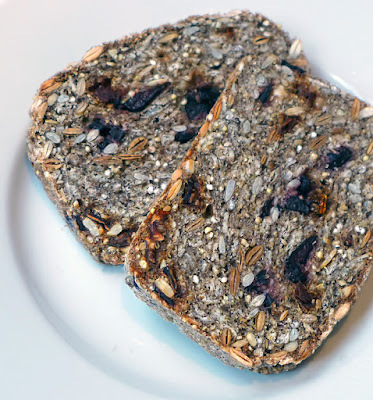 I may try to incorporate some of the ideas from these breads into the buckwheat bread." Some of the breads rose in the oven. See the nicely rounded top? "May try" ha ha ha. I've made about four breads so far, and although I have more experiments to go, it's time to describe what I've done and post a recipe. Maybe someone who reads this will try it, get a brilliant idea how to change and improve it, and save me the trouble! 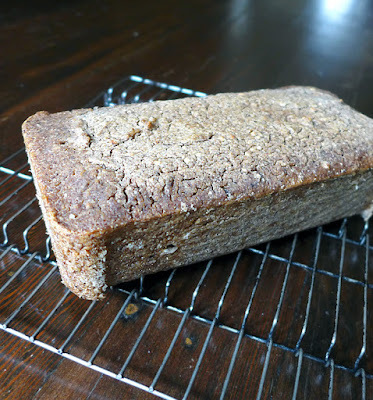 The first variation I tried was to substitute 1/2 cup of millet for the same amount of buckwheat groats, and incorporate aspects of the adventure bread (see link above). For one of the breads I was short on ingredients and substituted 1/2 cup of amaranth for 1/2 cup of buckwheat. (Don't do that.) 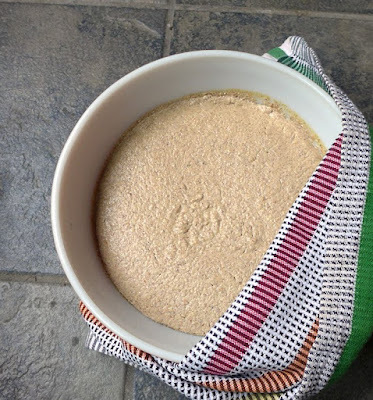 I soaked the buckwheat and millet overnight, as per the sourdough recipe, drained the grains in the morning, then briefly buzzed in the blender to incorporate the grains with the water, while leaving a lot of texture in the mix. Then I placed the grain mix in a large bowl, and added seeds, nuts, rolled oats and several other ingredients, including psyllium husks. 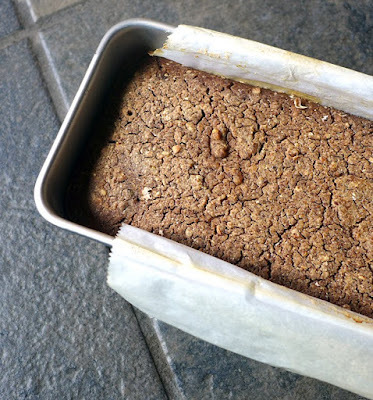 I packed the mixture into a oiled loaf pan and let it rest about four hours before baking. 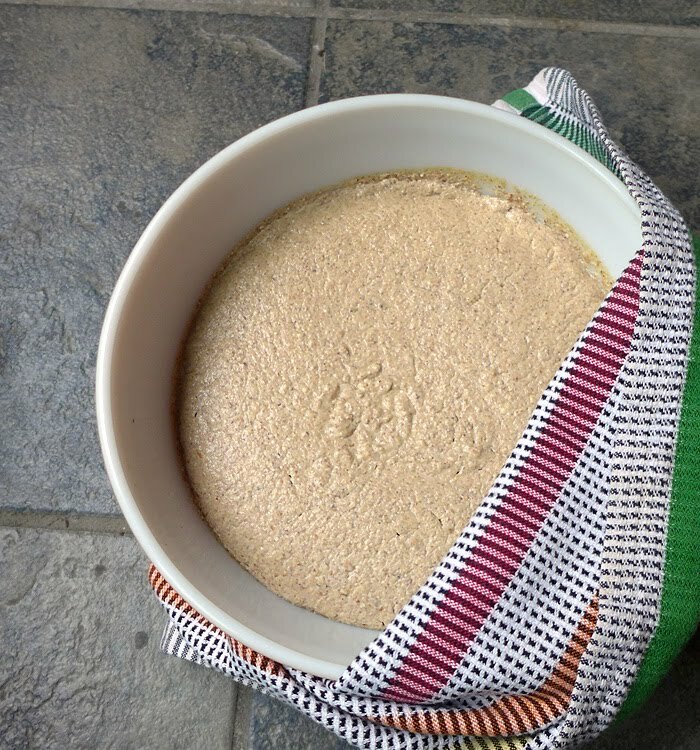 I was surprised to find that the loaf had risen during the baking process, and I wondered what would happen if I fermented the grain mixture overnight before baking, as in the original recipe. Would it rise more? With sunflower, pumpkin, and black sesame seeds, and walnuts. Don't think I like walnuts. Nothing much happened — that I could see, anyway. The mixture rises overnight when fermented, but the final bread doesn't rise more when baked, and I actually preferred the texture of the non-fermented loaf. 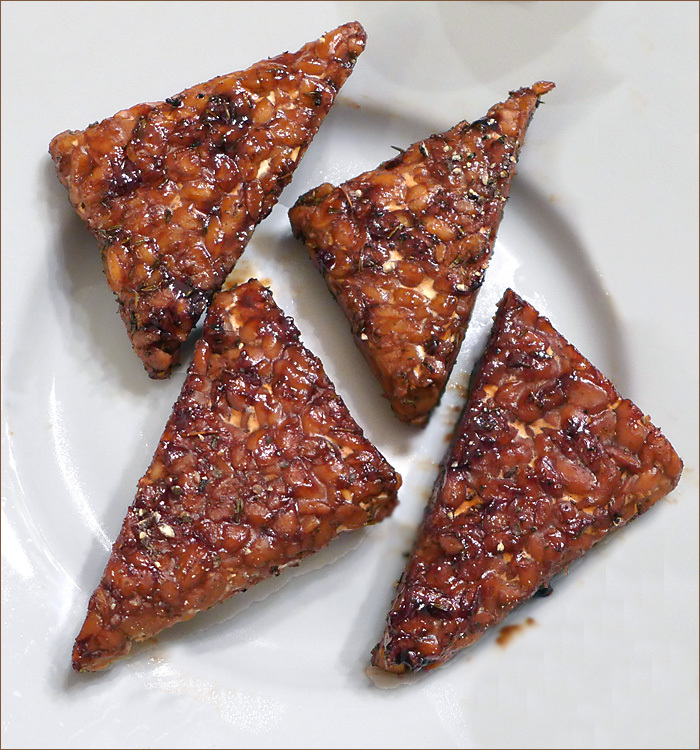 Another change I made was to lightly toast the nuts and seeds (except for the sesame seeds), and I think the toasting improved the taste, but is optional. I happened to have hulled sesame seeds which is why I didn't toast them — they seemed too delicate compared to whole seeds. I would toast unhulled sesame seeds, and will probably opt for unhulled next time I buy them. To toast, I put the nuts and seeds in a shallow ceramic baking dish and placed them in a 350˚F oven for 10 minutes. Check after five minutes to make sure they aren't burning. My oven tends to be slow. Unbaked loaf before resting and baking. 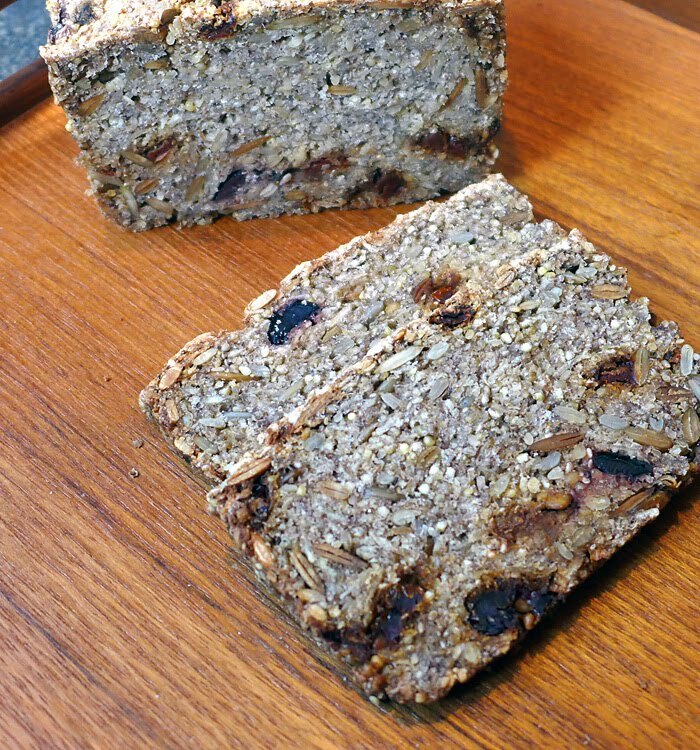 The last loaf I made had one cup of millet and one cup of buckwheat groats, seeds but no nuts, plus sun-dried tomatoes and kalamata olives. This was my husband's favorite. It was also the only loaf I shared with anyone besides my husband. My husband tends to like everything, so might not be the best gauge of how others might react. 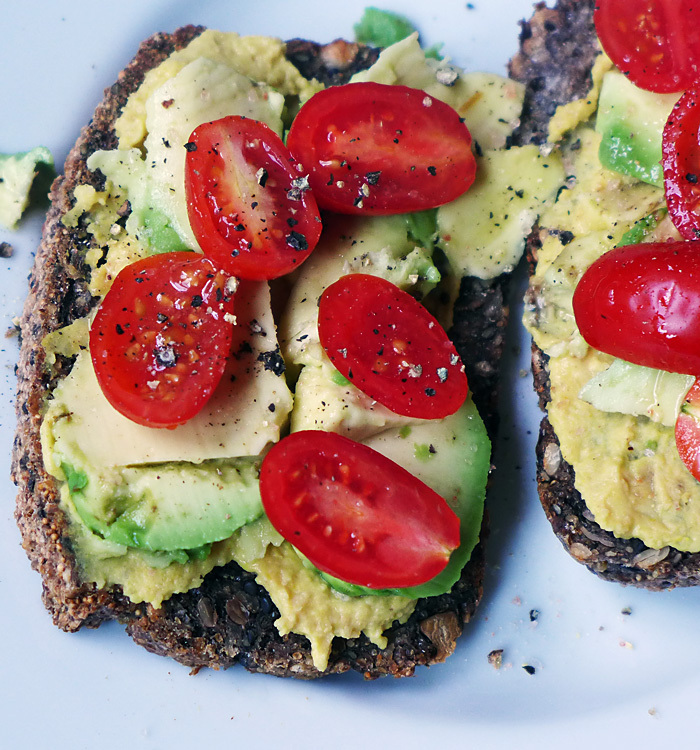 My son and daughter-in-law were at our house, and I gave them each a slice of avocado toast. They liked it, and my son asked if I could bring a loaf of the bread to Thanksgiving dinner, which I consider high praise, as he's such an accomplished cook. Sun-dried tomato and olive loaf. For some reason, the last loaf didn't rise during baking, and I'm wondering if it was because I made slits across the top before baking. Maybe it's steam that makes it rise. Or does it have something to do with the greater percentage of millet? Any scientists out there? I have more experiments lined up for the next few loaves but I'm going to share the recipe as it stands now. It seems to me you can probably vary the amounts and kinds of nut and seed additions with little effect on the finished product, as long as you keep the basic proportions of wet to dry. I'd suggest reading the original recipes that inspired me (links above), to fully understand the process, and, you might rather try one of those breads instead of mine. Also, keep in mind, if you want the recipe to be gluten-free, be sure to choose gluten-free ingredients. The bread is delicious, dense, heavy and satisfying, and is at its best toasted. I usually toast my slices two or three times. 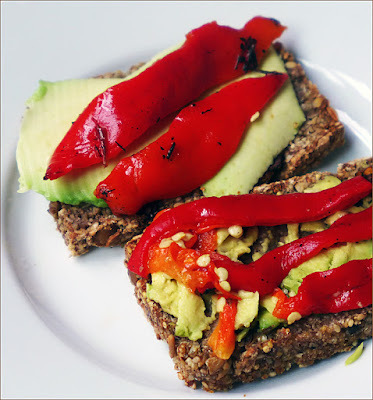 Avocado with roasted red pepper from the farmers market. Drain the grains well and place in the blender with 1-1/4 cups of water. Pulse a few times to integrate the grains with the water. The grains should be broken up but still coarse, not smooth. Place the mixture in the large bowl and incorporate the oil, sugar and salt. Add the oats, sesame seeds, chia seeds, sunflower seeds, pepitas, nuts if using, psyllium husks, tomatoes and olives. Mix well to incorporate ingredients. Feel free to use your hands, if desired. 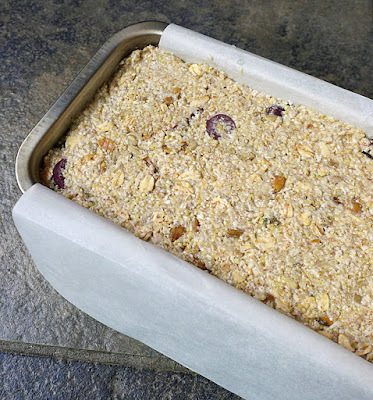 Pack the mixture into the prepared baking pan, cover with a towel, and allow to rest for four hours. Preheat oven to 400˚F. Bake at 400˚F for one to 1-1/4 hours. Remove the pan from the oven and allow to rest about 20 minutes. Loosen the ends of the bread with a knife, and lift the bread out of the pan. (You may need a helper to hold down the pan.) Remove the parchment and allow the bread to cool on a rack for two hours before slicing. Store the bread on a board, covered with a kitchen towel. The bread is most delicious when toasted. *The recipe also works well with 1-1/2 cups of buckwheat and 1/2 cup of millet. I don't know which proportion I prefer. *Coarse salt is less salty by measure than fine salt. If you only have fine salt, use 1/2 teaspoon. You're probably sick of reading about my bread by now, so I'll try to force myself to think about something else for a while, though it will be hard. I warn you, though, there will probably be a bread sequel. I didn't grow up eating mac and cheese. Nope. My mother had a terribly low opinion of noodles, and considered them to be filler — you only ate them to fill up if you had no other options. She grew up poor during the depression, and probably ate more noodles than she cared to remember. She scrimped and saved so her food budget would stretch to include meat on the nights my father was home for dinner, and chicken or fish on the nights he wasn't. The budget was tight, so she rarely bought junk food like chips or candy, and it wasn't until I was older that she allowed soda into the house. She was strict about what she considered 'healthy' foods worth spending money on. I remember once asking her to buy orangeade like I'd had at the neighbor's house, and she threw a fit about not throwing money away on sugar and water. If I wanted orangeade, she told me, I could add sugar and water to the orange juice we already had. I didn't. I asked often if she would please make spaghetti, but it was always a no. It wasn't until I told her my friend's mother made spaghetti one night a week, that she reconsidered. She thought very highly of my friend's parents, and I guess she decided if spaghetti was good enough for them, it was good enough for us. But mac and cheese? Never. When my kids were growing up, and our family was vegan, I never thought about making mac and cheese. The only available cheese was 'cheese sauce' that I made myself, and I didn't make it that often. And for me, mac and cheese never registered as a comfort food; it was just not something I ever thought of.. For my grandkids, though, mac and cheese seems to be always on the menu. They eat dairy products, though, and I've never been able to make a mac and cheese that Miss E approved of — until now. I made the insanely addictive queso from Naturally Lean, by Allyson Kramer. I added granulated onion and garlic to perk up the taste a bit (can't add actual onion because Miss E doesn't like to find onion bits in her food), and mixed about 3/4 of the cheese with 12 ounces of cooked noodles. 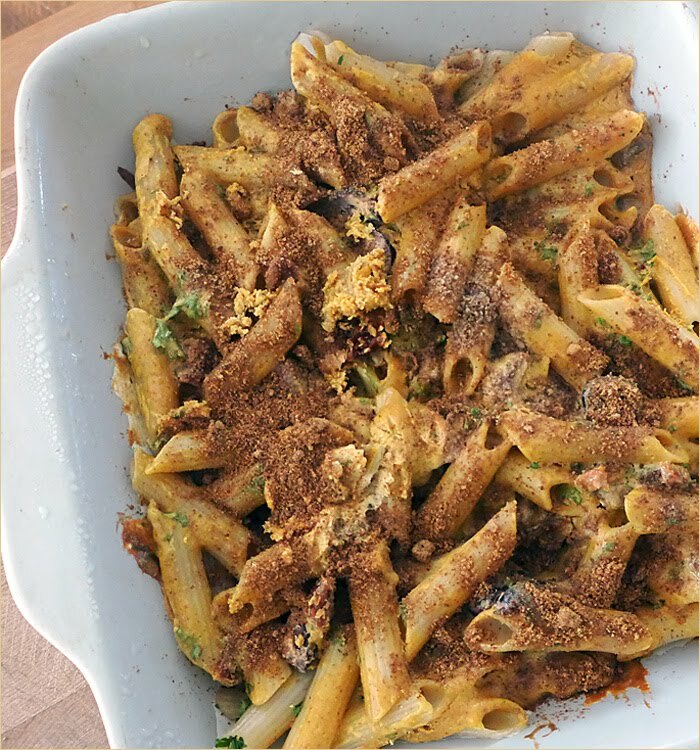 I transfered some of the plain mac and cheese to a small baking dish for the kids before adding 1/4 cup chopped dried tomatoes, 1/4 cup chopped kalamata olives and 1/2 cup chopped parsley to the rest, sprinkled it with bread crumbs, then baked it. Miss E loved it. She said, with enthusiasm, "This is good!" Her brother wouldn't taste it, but you can't win them all. I liked it, too, and plan to make it again. In my last post I talked about making a bread from buckwheat groats, and not being completely happy with the texture. I've been experimenting with the ingredients, combining ideas and ingredients from several recipes, and I love the results. I was going to include a recipe here but I have another bread experiment fermenting as I type, and I think I'll wait to see how it turns out. Also, we're in the midst of a weather situation here, and 10,000 people in Seattle are already without power. I think I'll just post this while I still can, and hope I'll be able to bake in the morning. Hope everyone comes through the storm with minimum impact. 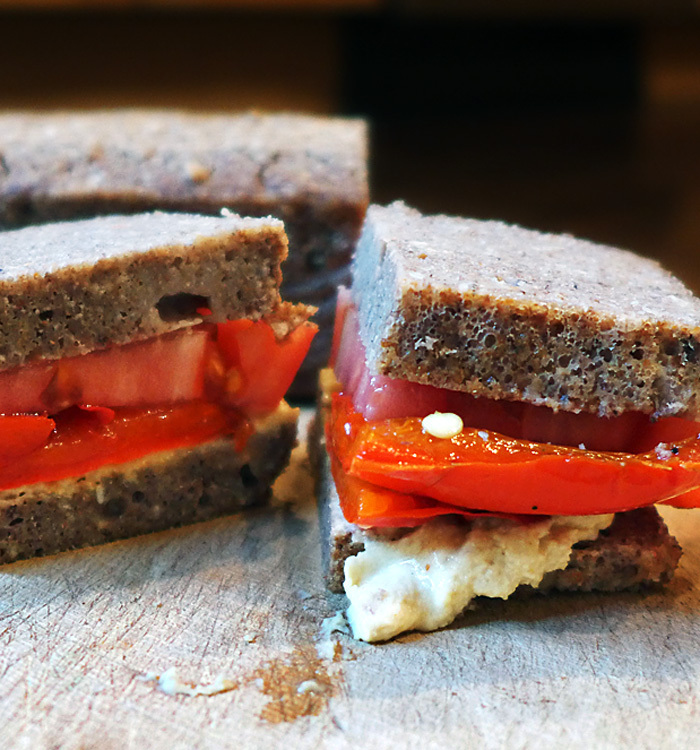 A tasty sandwich with roasted red pepper, tomato and homemade hummus. 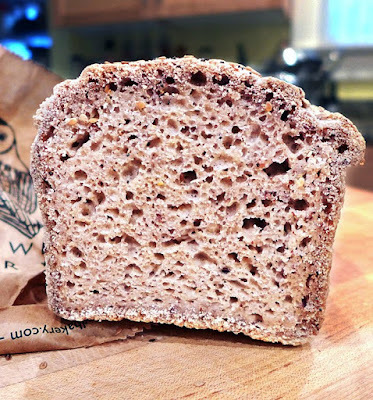 In my last post I mentioned purchasing a gluten-free sourdough bread that was beautiful and delicious, but the whole time I ate it I had bloating and discomfort. A reader, 'cv', suggested in the comments that my digestive distress may have been related to the psyllium husks in the bread's ingredients list, and she included a link to a recipe for GF sourdough bread made with only buckwheat groats, sesame seeds, salt and water. Even if I weren't trying to avoid gluten, I probably would have been sucked into trying the recipe just to see if it would work. 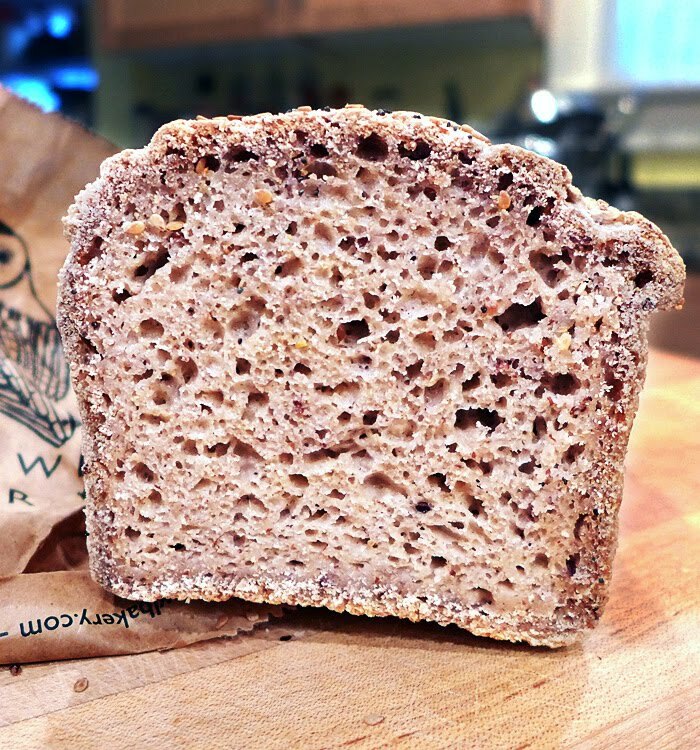 You sure don't have to be GF to appreciate a whole grain, fermented loaf. The batter after fermenting for 24 hours. The recipe is ultra easy, if waiting around for things to soak and ferment isn't an issue for you. The buckwheat is soaked over night, drained the next day, blended with water, salt and sesame seeds, then fermented for 24 hours before being baked. There are only four ingredients including the salt and water, and very little hands-on time. Using parchment paper helps in removing the baked bread. I followed the recipe as written, except I lined my baking pan with parchment paper to make removing the bread easier after baking. I was not about to mess around with such an unusual recipe. The finished loaf, cooling before being sliced. So how was the bread? The comments on the original blog post are extremely positive, which makes me think any disagreement I might have is probably due to something I did or didn't do as I followed the recipe. Did I over-blend? Did I bake it long enough? I like the taste a lot — probably because I like buckwheat, and the bread tastes like buckwheat. The texture, on the other hand, is not quite optimal. I don't know exactly how to describe it except to say it is a little mushy. Not wet, mushy, but it doesn't offer resistance when chewed, if that makes sense. It kind of falls apart in the mouth. Still, I do like it, and toasting it several times improves the texture. My bread slices look more dense than the ones on the original blog post, though I'm not sure what would cause that. I'm planning to experiment a little with the recipe, maybe even add in some psyllium husks, both see if the texture changes, and to see if I react to it. I can guarantee the bread won't be wasted if do react because my husband likes it a lot. I also might add other grains as well as seeds. Some time ago I made a very good nut and seed bread based on Josie Baker's adventure bread, (which in turn was inspired by My New Roots Life Changing Bread). I may try to incorporate some of the ideas from these breads into the buckwheat bread. Experimenting with new (to me) ideas is what makes cooking interesting! Do you like to experiment with unusual recipes or prefer to make things you're pretty sure will work? The longer it takes me to write a new post, the harder it is to refocus; I have lots of ideas I want to share but 'things' keep getting it the way and I put off writing. Then I become a procrastinator, and writing gets even harder as time moves farther and farther away from what I had intended to post. Does this ever happen to you? For now, I'm going to do one of those random, recap posts to catch up, and try harder to stay up to date in the future. At least that's what I intend. In my Sept. 13 post, I described a mini-vacation we took on Orcas Island, and mentioned a vegan, gluten-free sourdough bread we found in the local food co-op. It was a Barn Owl Bakery bread, and it looked gorgeous and tasted great. I was pretty excited to find the loaf, and started planning how to ferment GF sourdough starter and make bread when we returned home. Before bidding gluten goodbye, I used to be a darn good baker, and regularly made both regular and sourdough loaves as well as the on-demand bread that's made from dough kept at the ready in a tub in the refrigerator. I was so happy to find the beautiful Barn Owl Bakery bread, and it inspired me to want to bake again. 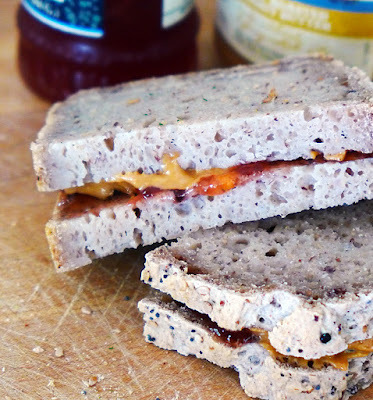 I made peanut butter and jelly sandwiches to take on a day hike and they were delicious. But, after eating the bread, I had much intestinal distress and cramping — not the most horrible cramping, but still uncomfortable. Gluten free readers — what do you make of this? 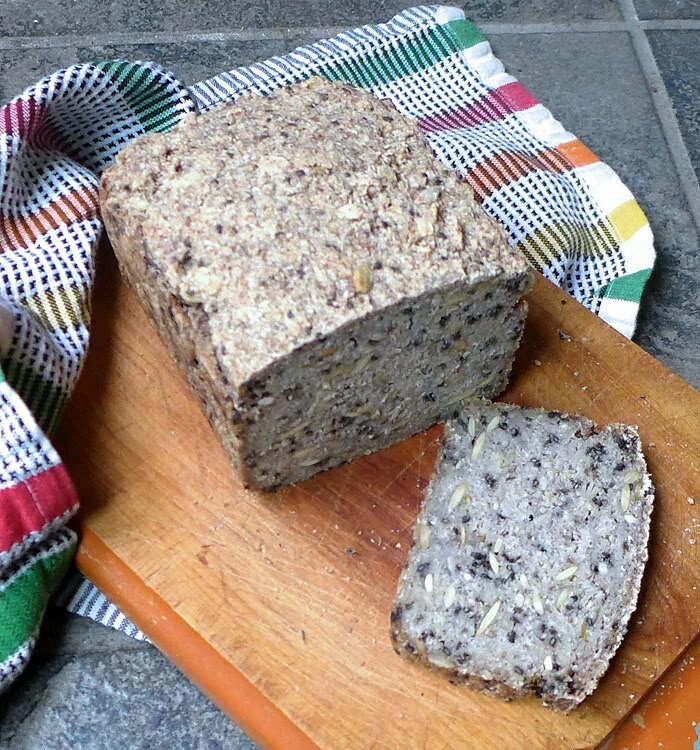 Do you bake sourdough bread at home? The ingredients look perfectly fine to me. What do you think? When I get an urge for a sandwich I usually make a batch of bannocks. The last time I got a craving for something in a bun, I lightened up the slightly heavy bannocks with a small recipe adjustment, and used them to hold kidney bean burgers. My husband made the burgers from a recipe while I made the buns. The burgers fulfilled my desire for a messy, dripping sandwich, but weren't quite good enough to go on the make-again and-share list. 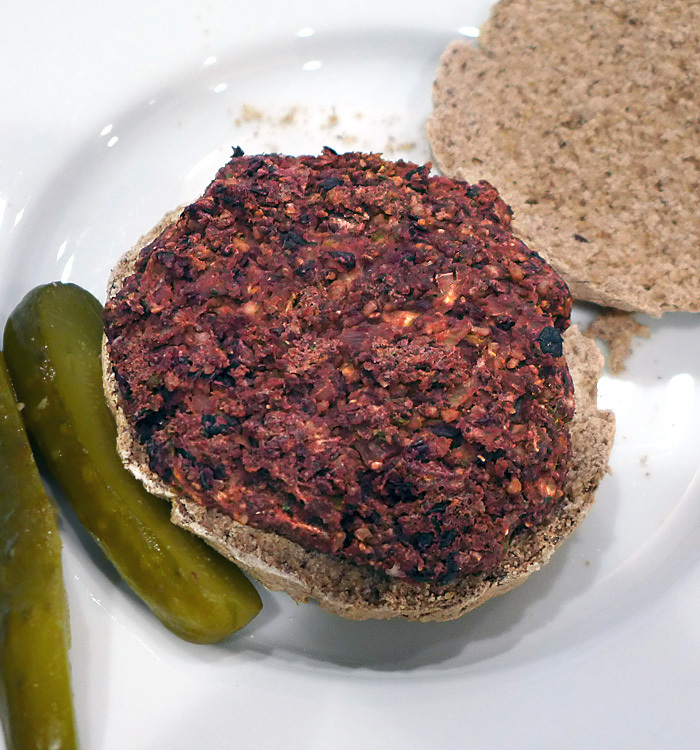 We have other burger recipes we like much better, but it's always fun to try new things rather than use the same old recipes again and again. My sushi rice cooked in the Instant Pot is getting so much better since the first time I made it when it turned out more like rice pudding. I think the magic ratio is one cup of rice to 1-1/4 cups of water. I used standard measuring cups for the rice and water rather than the cup that came with the Instant Pot, and the rice had a great texture. After the cooking time was up, I let the rice stay in the closed pot for about 20 minutes. I seem to have a never-ending craving for vegan sushi, and even writing about it now is making me want some. Polenta is another one of the foods I get cravings for, so when I make it (in the Instant Pot, of course) I make extra to use the next night, or for lunch. Here is a plate of leftover polenta enhanced with stir-fried tofu and bok choy, sprinkled with toasted peanuts. I suppose the polenta was slightly out of place here, but it sure tasted good! I don't know how many vegan blogs there are, but I just received notice that my little blog is among the top 100. At least according to feedspot.com. So for whatever it's worth, if you are interested in discovering more vegan blogs, you can use the list of 100 as a starting point. I'm honored to be on the list with so many great blogs.